Yes, I know it’s hard to see. Click here to see it larger. This is one of my all time favorite birds, the brown creeper. Talk about camouflage! It looks like bark. It walks on bark. 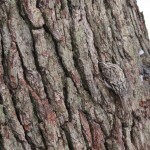 Sometimes it nests on bark that has slightly pulled away from the tree. I photographed this one December 2009, here in Indiana.